Samuel and Ada Denton. Image courtesy of Neal Denton. While researching the life and work of Ernest Denton, I didn’t want to lose sight of Samuel Denton, his brother. He appeared in Berlin (now Kitchener) with Ernest sometime in 1913-1914 and was the other half of Denton Brothers and likely a partner in the Berlin Portrait Room. But who exactly was Samuel? While his Ontario marriage certificate and California death registration record Samuel’s birthdate as 17 May 1892, I believe that he was born in late 1889 as Simon Dembovitch in Prestwich, Lancashire. His parents were Lithuanian emigre, Eli Dembovitch, and Dora Koriensky. Simon made his first appearance in the 1891 UK census as “Simon Dembovith” (which appears to be a misspelling of the family name) and then appears in the 1901 UK census as “Simon Denby”. In the 1911 UK census, his given name is recorded as “Sam Denby”. Based on his age, he probably learned the photographic trade from his brothers Myer and Harris (who may have been Ernest). On his 17 April 1913 transatlantic crossing, he provided the Denby family residence at 44 Alma Street, Blackburn as his home address. Samuel was married to Ada Frances Rowe in Toronto on 21 November 1917. The correction of “Residence when Married” from New Zealand to Toronto made me pause. Had Samuel been in New Zealand with Ernest? I did a quick check of the New Zealand Papers Past database, but it did not reveal any clues for “Samuel/Sam Denton”. Nevertheless, I’ll keep looking. 21 Nov 1917 Ontario marriage registration for Samuel Denton and Ada Rowe. Source: Ontario Marriages, 1869-1927,” database, FamilySearch (https://familysearch.org/ark:/61903/1:1:QKM5-7B35 : accessed 18 December 2015), Ontario, Canada, Archives of Ontario, Toronto; FHL microfilm 2,130,571. While little is known about Samuel’s early days in Berlin, there is an interesting 16 Feb 1920 “Request to Photograph Pupils of Public Schools” notice in the Kitchener News Record. The article, which appeared after Samuel’s departure from Kitchener, seems to suggest that Ernest and Samuel were still working together. It may be possible that Samuel returned to visit Ernest as he travelled extensively in later life as a commercial photographer. The notice also mentions that the brothers enlisted in the 118th Battalion but were turned away due to “no fault of ours”. Searches of the attestation papers of the Canadian Expeditionary Force did not turn up Samuel or Ernest. Interestingly, the notice mentions two brothers who served overseas, one of whom was still in India. The brother in India was Louis Denby – a fact confirmed by his grandson via my Blackburn researcher. Myer Denby was likely the other brother. A son, Douglas Ernest Denton, was born to Samuel and Ada in Victoria BC in 1918. I was lucky to have connected with a grandson of Samuel who shared amazing stories of his father’s exploits as a young sailor and his WWII war experience in the Royal Canadian Air Force. Like his father, Douglas Denton was a photographer. Samuel, Ada and Douglas Denton, 1942. Image courtesy of Neal Denton. While crossing the Canada/US border in 1945, Samuel dated his US residency (in Oakland California) starting in 1919. Samuel worked as a photographer in the Oakland area for many years and operated a camera shop with his son, Douglas, for a time. I learned from Diane Curry, curator and archivist at the Hayward Area Historical Society that Samuel took panoramic photographs of Oakland area companies and their employees – so reminiscent of Ernest’s work here. She kindly shared these images from the Hayward Area Historical Society collection. Del Monte cannery employees. Photograph taken by Samuel Denton. Image courtesy of the Hayward Area Historical Society. 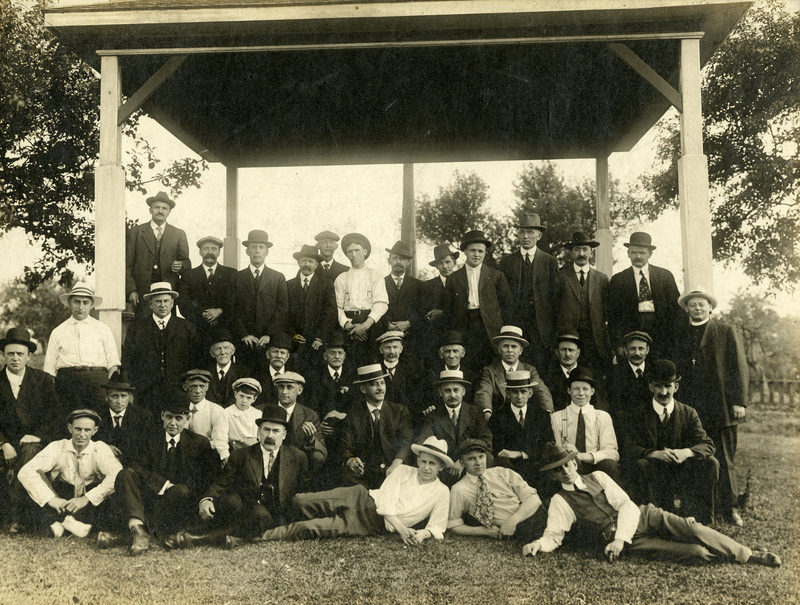 Pratt-Low Preserving Company – Grand Island Branch – employees. Photograph taken by Samuel Denton. Image courtesy of the Hayward Area Historical Society. Samuel Denton image stamp. Courtesy of the Hayward Area Historical Society. Oakland Tribune newspaper article. undated. Samuel Sydney Denton died on 3 October 1983 in Alameda, California. As Ernest’s partner in Denton Brothers, Samuel contributed to the large body of early Denton work documenting our community and that of the cities of Oakland and Alameda California. Acknowledgements: My thanks go to Neal Denton for his memories and photographs and to rych mills, Waterloo Historical Society, Diane Curry, Hayward Area Historical Society, Kirsten Baldock, Oakland Public Library and Jared Mariconi, California State University – East Bay Library for their assistance in locating information about Samuel Denton. This post is a quick follow up on my last Ernest Denton post and my UK research on the Denton brothers’ origins. The discovery of the Denton/Denby/Dembovitch connection led me down several interesting paths. Myer Denby – Explosive cigarettes court case – Manchester Courier and Lancashire General Advertiser, 22 Jan 1904, p3. Myer Denby appears to have been in business with his uncle Myer Franks (married to Eli Dembovitch’s sister, Betty) in early 1904 and to have been trading in “explosive cigarettes”. It is interesting to note that Ernest’s 11 Nov 1957 obituary noted that he had photographed the 1904 New Zealand Parliament which opened in June of that year. Was Ernest actually Myer Denby who made a hasty exit from the UK following this episode? I can’t say for sure, but it does make for an interesting story. 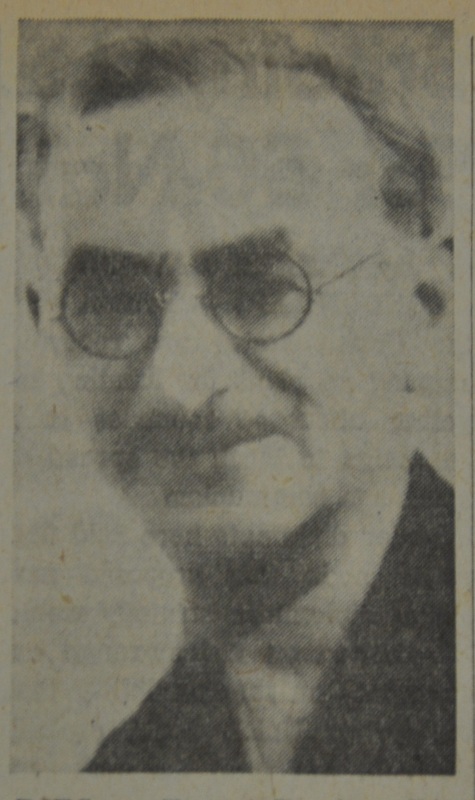 The other connection that I made during my research was to a Lancashire researcher who kindly shared with me his Dembovitch family notes, helping to confirm the Eli and Dora Dembovitch link to Ernest and Samuel Denton. My Dembovitch research connection is a friend of the grandson of Louis Denby – so I’ve been able to help fill in a few blank pieces in their family history – which has been a happy consequence of this project. What I found interesting is that the family had heard a story about two brothers of Louis who travelled to America and had their passage paid by father, Eli. This seems to fit with the departure of Ernest and Samuel, who left in 1913 for Canada. We are still looking for UK and Canadian connections to Ernest and Samuel and the extended Denby family. If you have any leads or information, please drop me a line using the contact form on the blog. Local historian rych mills pointed me to some Kitchener Daily Record articles which detailed Ernest Denton’s interests in an apartment building near Weber and Victoria and the Tom Thumb Indoor Golf Course in the Dunke building on King Street West in the early 1930s. The articles demonstrated Ernest’s keen business sense and community involvement. Many thanks go to rych for his enthusiasm for this project and his Denton insights. And, I wanted to also thank Laureen Harder-Gissing of the Mennonite Archives of Ontario for permission to use the image of Ernest Denton and his camera (1945) on my “Desperately Seeking Ernest” post. It was such a timely addition to the MAO online collection – especially when I had just about given up hope of finding an image of Ernest Denton. The panoramic at the top of this post is reportedly the last image taken with Denton’s Cirkut camera. It was taken by photographer, Al Pirak, on 28 June 1961 at the Kitchener-Waterloo Real Estate Board picnic. The camera is now part of the collection of the Canada Science and Technology Museum in Ottawa – the donation of which set in motion our blog series on Denton and the Cirkut camera. Many thanks to Michel Labrecque for his invitation to explore the history of the camera and the work of Ernest Denton. If you take a close look at the picnic image, you’ll see a panoramic prankster. The same man appears at each end of the second row – a fleet footed picnic participant who managed to be captured twice by the rotation of the Cirkut camera. I haven’t closed the book on Ernest. I’ll be looking for him in my travels and welcome any information about him, his work and his family. Up next, Samuel Denton’s story. Stay tuned! Little did I know that when I started the Denton / panoramic camera blog series with Michel Labrecque, Assistant Curator, Canadian Science and Technology Museum, in February of this year, I would still be researching and writing about Ernest Denton in November! For someone who was a prolific and beloved photographer of Kitchener and Waterloo County, Ernest Denton was a man of mystery, particularly for his early life and exploits. At the Canadian Science and Technology Historical Association annual conference, held at York University on Sunday 8 November 2015, Michel and I did a joint presentation on our collaborative blog series. It was great fun to finally meet Michel in person. We spent the little free time we had before the presentation discussing new discoveries and connections – so much so that we forgot to take photos or tweet! Our presentation, part of a material culture panel, was well received. I am indebted to Michel for his enthusiasm and interest in the camera and Ernest Denton. It was truly an honour to have worked with him. When the Historically Speaking / Collect Connect blog series ended in March, I was eager to learn more about Denton’s early days in Manchester. Despite my best efforts, I could not find any trace of him. This was my “Denton” summer. I made it my mission to find him. Since Ernest was proving to be a bit of a dead end, I started researching Samuel. I learned that his 21 November 1917 Ontario marriage registration to Ada Rowe gave his parents name as Eli Denton and Dora Phillips – a starting point finally – or so I thought. They, like Ernest, vanished into thin air – I could not find them anywhere. As many genealogists will tell you, when you hit a brick wall, you need to re-evaluate your assumptions, research and methods. I went back over my notes looking for something that I may have missed or overlooked. I had noted that Ernest’s religion was recorded as ‘Jewish’ on the 18 April 1913 passenger list for his arrival in New York, but more importantly, I realized that another clue may lay in the UK home addresses he and Samuel provided on the 8 April 1913 sailing on the Cymric from Liverpool – a possible link to family and community. The fact that Ernest claimed a wife on this passenger list was intruging, but proved to be another dead end. A “Mrs. Denton” on either side of the Atlantic was not been found. My research on the UK addresses, plus a careful and comparative reading of the 1881, 1891, 1901 and 1911 UK censuses has lead me to the conclusion that the Denton brothers were the sons of Eli Dembovitch and Dora Crienski. Eli was a macintosh maker and travelling draper who had emigrated from Vilkaviskas, Lithuania, to Manchester in the 1860s. Ernest was likely born as Harris Dembovitch on 16 October 1882 in Prestwich, a suburb of Manchester, based on his relative age and occupation. By the time of the 1901 census, the family surname changed to Denby. They resided on Rectory Road in Burnley. Family members included Eli and Dora Denby, daughters Leah (b.1880), Annie (b.1886), Ethel (b.1895), Minnie (b. 1898) and Phyllis (b. 1900), and sons Lewis (b. 1888) and Simon (b. 1890). Harris and older brother, Myer Denby (b. 1878) were living in an Everton, Liverpool boarding house and earning their living as photographers. According to the 1911 UK census, the Denby family was living at 44 Alma Street, Blackburn, Lancashire. Interestingly, the census takers erroneously recorded, and later stroked out, Myer and Harry Denby as “living abroad” as photographers. Their absence from the UK, coincides with Ernest’s sojourn in New Zealand. The Denby family home address was the same given by Samuel Denton on his 8 April 1913 passenger list. The Blackburn Library was also able to confirm that Eli Denby lived at this address in 1913. Ernest provided the address of his maternal aunt, Rachael (nee Crienski) Cossack in Oldham on the 1913 passenger list. There’s more to tell and some interesting connections made – so stay tuned! I’d like to thank the following people and organizations who generously helped with my queries and research: Tony Blackburn; Mary Painter, Blackburn Central Library – Local Studies; Christine Drummond & Susan Smith, Oldham Local Studies and Archives; Edmund Dunne, Manchester Central Library & Archives; Roger Hull, Liverpool Record Office, Sally Evans, Wakefield Archives, West Yorkshire Archives Service; Wendy Gradwell, Bury Museum & Archives; and Christine Wilde, Greater Manchester Police Museum & Archives. I wanted to let everyone know that my Denton update will be slightly delayed. Happily, I’ve recently made contact with a researcher in Manchester, who has very graciously provided some family information and we are in the process of confirming details, timelines and facts. I hope to be able to post in mid-October with an update on Ernest Denton and his life in the UK. If anyone has a photo of Ernest Denton, I’d love to hear from you! We do not have an image of Ernest in the collection, other than the image that appeared in the newspaper. We are also interested in learning about Denton photographs that exist in the community. If you have a Denton (including Denton Brothers, Denton-Gifford , etc.) photograph (panoramic or otherwise), please drop me a line! We are not looking for donations (but if you are so inclined, we can talk! ), but want to get a sense of the subject/title/description, size and date of the Denton that you have. He was such a prolific photographer who documented Kitchener life that we’d like to set a sense of the history that he captured in our community. There’s no obligation to share your name or address in connection to the image, but if you let us scan it for use in our collection, we’ll provide you with a copy of the digital scan as a thank you. Please contact me by email (using the Contact link below the blog title) or phone (519-743-0271, ext. 252) to arrange a time to bring in your Denton or to discuss the image to be included on our register. Please note that I’ll be away from the Library Sep 27-Oct 13, 2015. Lastly, on the Denton front, Michel Labrecque and I will be presenting a session on Denton and his Panoramic Camera at the upcoming Canadian Science and Technology Historical Association annual conference. The conference will be held on 6-8 November 2015 at York University. I am looking forward to finally meeting Michel in person. I’ll be sure to post about our conference presentation. With the Central Library project final push looming in early 2014, I received a query from Michel Labrecque, assistant curator at the Canadian Science and Technology Museum, about Ernest Denton, a well-known Kitchener photographer. His query was a welcome distraction from the construction, temporary work spaces, and packing and unpacking. In fact, Ernest Denton was a familiar name – his photographic work was scattered throughout our collection. Michel’s query seemed an innocent query enough – did we have any information on Ernest Denton? Little did I know, I was to embark on a real journey of discovery – the existence of a possible link between the panoramic camera at Canadian Science and Technology Museum and the Grace Schmidt Room. My interest was hooked from our initial discussions over the phone regarding Denton’s life and work. Michel’s questions had me elbow deep into a collection that was still on the move. While I was not able to provide a list of all Denton images as our subject-based paper photo index was not searchable by photographer, I could quickly identify his panoramic images in the collection as they are stored by size. We had just moved into our new space and were waiting for the completion of the GSR reading room – so I had a small window of time to do some research . 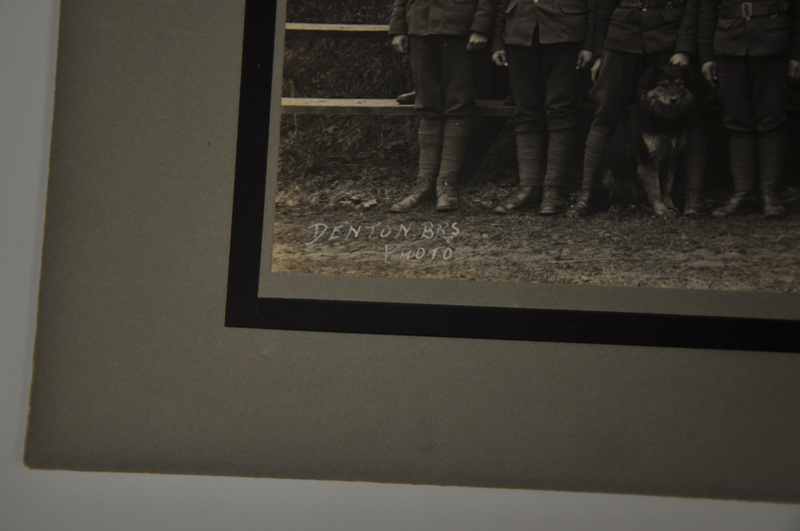 As I dove into the oversized boxes, I came across several Denton panoramic images in the Waterloo Historical Society collection in the GSR of the 118th Battalion, a recruiting unit of the Canadian Expeditionary Force in the north part of Waterloo County. Given Michel’s specific query about Denton panoramics dated in the 1910s, these images seemed to be a perfect fit for the Cirkut camera that he was researching. Michel had me photograph, describe and measure the images and search for any imprints or markings on the mats (including reverse sides). With great satisfaction, I received a tweet from Michel in July 2014 that the panoramics looked authentic to the Cirkut camera! 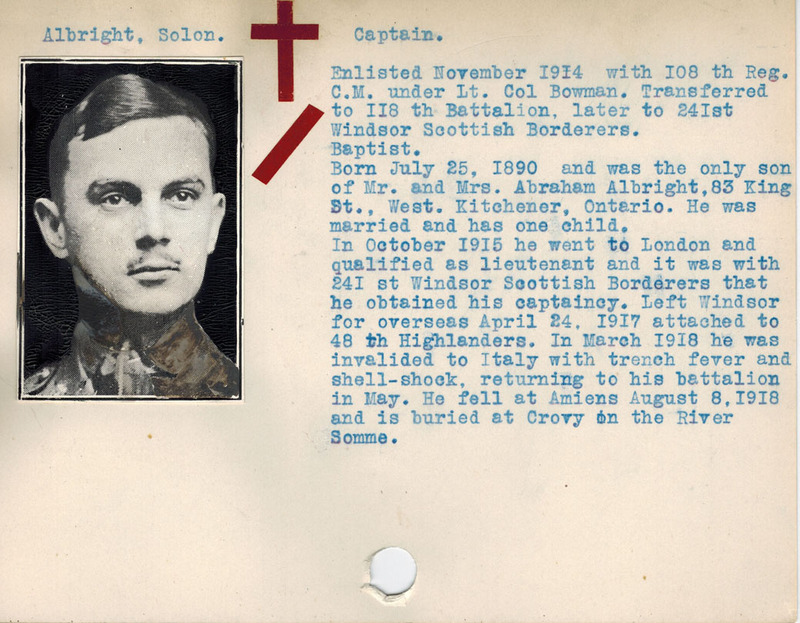 Given that the Soldier Card Project was in full swing, I felt a great kinship to these images – many of the faces of the soldiers seemed so familiar. 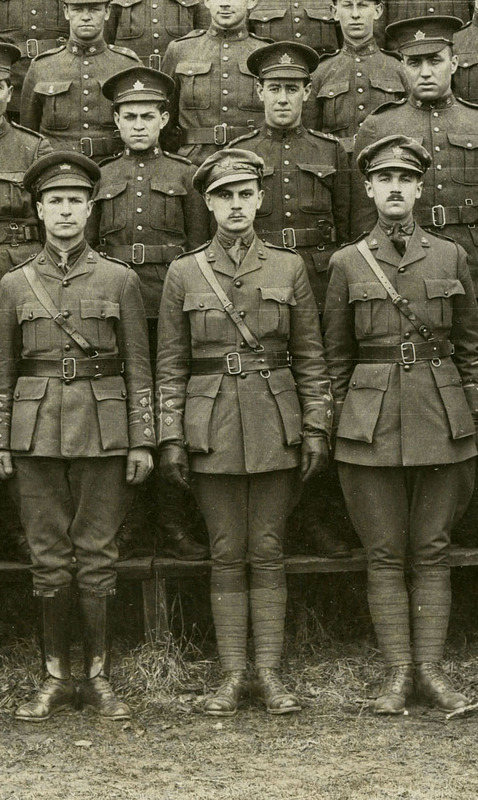 In particular, I was able to identify Captain Solon Albright, in the front row, centre, in the B Company portrait. As an unit of the Canadian Expeditionary Force during the First World War, the 118th (North Waterloo) Battalion began recruiting in late 1915. After sailing to England in January 1917, the battalion was absorbed into the 25th Reserve Battalion on February 6, 1917 and dispersed into other units as needed. Denton photographed the 118th Battalion companies A-D in what seems to be an enclosed field or grandstand – perhaps Victoria Park in the tumultuous months leading up to the name change of Berlin to Kitchener or at the training grounds in London,Ontario. Three of the four images had horizontal labels, giving the moniker “Denton Studio” below the image, while the B Company photo had no label and was marked “Denton Bros” in the lower left corner. On closer examination of the B Company photo, my eye also caught sight of the dog being held by the young man third from the left – a touching reminder of the bond between people and animals. I’d love to hear from anyone if they have ideas or suggestions as to where the images were taken, the activities of the 118th Battalion at the time of the photographs or if you recognize any of the soldiers in the images. It’s amazing to ponder the convergence of so many factors in these images – young men about to head off to war, a (possibly) smuggled Cirkut panoramic camera, and Ernest Denton, the world traveled photographer all coming together on a spring day in May, 1916, isn’t it? 2. World War I Soldier Card Project. Kitchener Public Library. 3. rych mills. Kitchener (Berlin) 1880-1960. Charleston, SC : Arcadia Publishing, 2002. Kim Grimes for her memories of Ernest Denton; Willy Nassau and Dolph Bogad for their visit to the GSR and memories of the Cirkut camera and knowledge of panoramic photography; rych mills for his insight on Denton and the 118th Battalion; and Michel Labrecque for explaining the intricacies of panoramic photography and camera technology. * For those eagle eyed readers, you may have noticed that the 1929 Denton advertisement claims that they have been in business for 20 years, which would put the start of their business around 1909. While my research places the Denton Brothers in Kitchener around 1912-1914, I will continue researching their early life and post any new findings on the blog. If you have any information on their early years in Kitchener, I’d love to hear from you! A 1916 picnic in Berlin – image taken by Ernest Denton. (P2399 WHS). Please note that image was not taken with the Cirkut camera. Thanks, Michel, for that fascinating introduction to Cirkut Panoramic camera and panoramic photography. Having met with Willie Nassau and Dolph Bogad on Monday, I have a greater appreciation for the technical and artistic expertise that Ernest Denton had to operate this type of camera. My first exposure to Denton was in exploring the rack of oversized, framed photographs in the Grace Schmidt Room. The hand-printed and slightly skewed identifier “Denton Bros.,” “Denton Portrait Rooms,” or “Denton Photo” in the lower right hand corner was a frequent sight. The more I saw of his work, the more I wanted to know about this man, who seems to have photographed every aspect of Kitchener life between 1913 and 1955. Visit of the Duke of Connaught to Berlin City Hall, 9 May 1914 – image taken by Denton Bros. (P290 WHS). Please note that image was not taken with the Cirkut camera. I have had much fun trying to fill in the blanks – but the details of Denton’s early life in England and abroad are still very sketchy. I’ve been in contact with libraries and archives in Manchester, England, Wellington, New Zealand, Oakland, California and Waterloo, Ontario – in an effort to track down information about Ernest and his family. What is known about Denton primarily comes from a cryptic first page of a 15 March 1956 letter written by Kitchener-Waterloo Record editor, Henry Koch, to Ralph Allen, editor of Maclean’s magazine and Denton’s 11 November 1957 obituary in the Kitchener-Waterloo Record. Koch tried to entice the Maclean’s editor into writing a story about Ernest, but according to their archivist, a Denton feature did not materialize. Ernest Denton was born 31 August 1883 in Manchester, England. He started his photography career at the age of 16, on bicycle rigged to carry a camera and portable darkroom. He travelled throughout the whole of England and later around the world by ship, by photographing ship crews, collecting money upfront and mailing the images later. It’s rumoured that Denton travelled twice around the world, working in places such as Fiji, Ceylon, New Zealand, Australia, Italy, Gibraltar, and Egypt. In New Zealand, Denton operated photographic businesses in Invercargill (1907), Wellington (1907-1909) and Palmerston North (1909-1912). Koch claimed that Denton freelanced for illustrated weeklies for five years in New Zealand, which saw him photographing everything from the House of Commons, the 1906 International Industrial Exhibition to earthquakes and floods. A report in the 23 April 1910 edition of the Wairarapa Age noted that Denton had been fined 1 shilling plus costs for working on a Sunday. His Palmerston North studio was destroyed by fire on 17 March 1911. In June of the same year, Denton returned briefly to England for health reasons. His business last appears in the 1912 Wise’s New Zealand Post Office Directory in Palmerston North and then the trail goes cold, that is, until April 1913. Ernest Denton’s advertisement from the 1912 Wise’s Directory (New Zealand). Image courtesy of the Dunedin (NZ) Public Library. Ernest Denton and his brother, Samuel, arrived in New York City, aboard the Adriatic on 19 April 1913, with the declared destination of Montreal. How and why they chose to come to Berlin is not known. Local directories in the Grace Schmidt Room first catch their presence in 1915, but it likely that they arrived in 1913 or early 1914, based on some of the early Denton images in our collection. Their first business venture, Denton Brothers Photographers, was located at 62 King Street, Berlin. Of particular interest was a cryptic note that Koch made in his 1956 letter to Ralph Allan, mentioning that Denton owned one of two known panoramic cameras in Canada. Koch went onto say that Denton had the camera smuggled across the border from the US. Why would he smuggle a camera into Canada? And how would he have done it? These are questions yet to be answered. A panoramic of the A Company, 118th Battalion, taken by Ernest Denton, May 1916 (P2683 WHS) We believe that this image was likely taken with the Cirkut Panoramic Camera at the Canada Science and Technology Museum. Following brother Samuel’s departure from Kitchener, Ernest worked with another photographer in a studio named “Denton & Gifford” between 1924-1925, and then, on his own, operating a studio at 163 King Street West. His advertising byline was “Photos made anytime, anywhere”. He was also very active in business interests outside of photography. In the 1930’s, Denton owned an apartment building at the corner of Victoria and Weber Streets and an indoor mini putt golf course in downtown Kitchener. However, photography remained his mainstay and he continued to photograph schools, picnics, companies and businesses throughout Waterloo and surrounding counties. He remained at the 163 King Street West location until 1955, when his studio was destroyed by fire on the evening of 11 December. 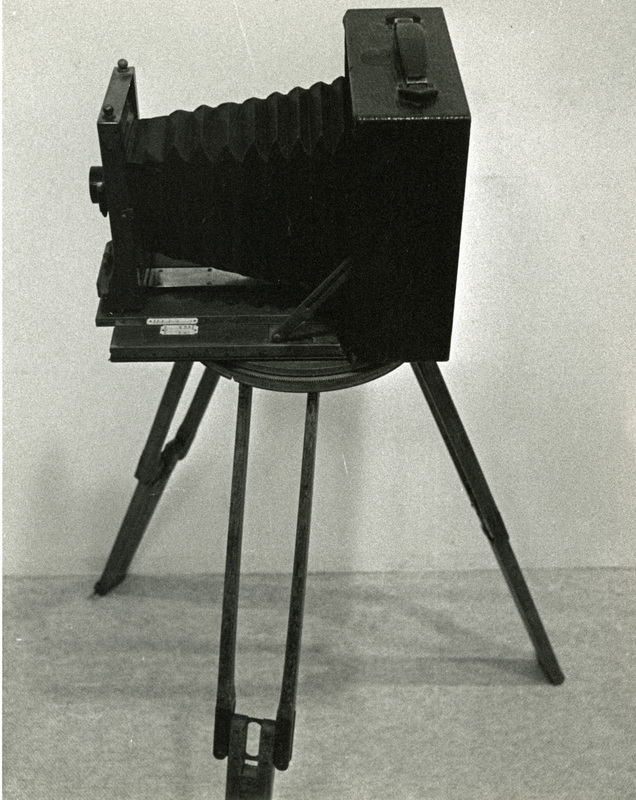 Everything was lost – except, his panoramic camera which now resides at the Canada Science and Technology Museum. Denton died on 10 November 1957 at his home at 55 Samuel Street, Kitchener, after a lengthy illness. He was survived by his wife, Louisa, stepchildren Fred, William and Rose Manning and Vera (Manning) Bennett, his brother Samuel, 11 grandchildren and 16 great-grandchildren. Koch estimated that Denton had taken over a million photographs over his career, ranging from Waterloo County school classes, factory workers and military troops to coronation of King George V, prime ministers Robert Borden, R.B. Bennett, Mackenzie King and Winston Churchill. A very interesting life and man, don’t you think? If you have comments, questions or information to share, please let me know! Photographer of Prominent Persons Dies (obituary – Ernest Denton). Kitchener –Waterloo Record, 11 November 1957. Koch, Henry. Letter to Ralph Allen, editor, Maclean’s Magazine (photocopy). 15 March 1956. National Library of New Zealand. PapersPast (database: http://paperspast.natlib.govt.nz/). Vernon’s Kitchener and Waterloo City Directory. Jane Britton, former Head, Special Collections and Archives, University of Waterloo, for her thoughtful insights on Ernest Denton, Kirsten Baldock, Oakland Public Library, Dale Taylor, Archives and Local History -Manchester Central Library; Jenni Chrisstoffels, National Library of New Zealand, Malcolm Deans, Dunedin (NZ) Library, Heather Glasgow, Palmerston North (NZ) City Library, Jared Mariconi, California State University – East Bay Library, Patricia Treble, Maclean’s Magazine and Rod Frketich, Photo/Graphics Editor, Waterloo Region Record for their assistance with locating information about the Denton brothers; rych mills for his Denton citations; Charlotte Prong, Kitchener Public Library, for her love of good story; and Michel Labrecque for his knowledge and infectious enthusiasm for photography and a panoramic camera owned by Ernest Denton. 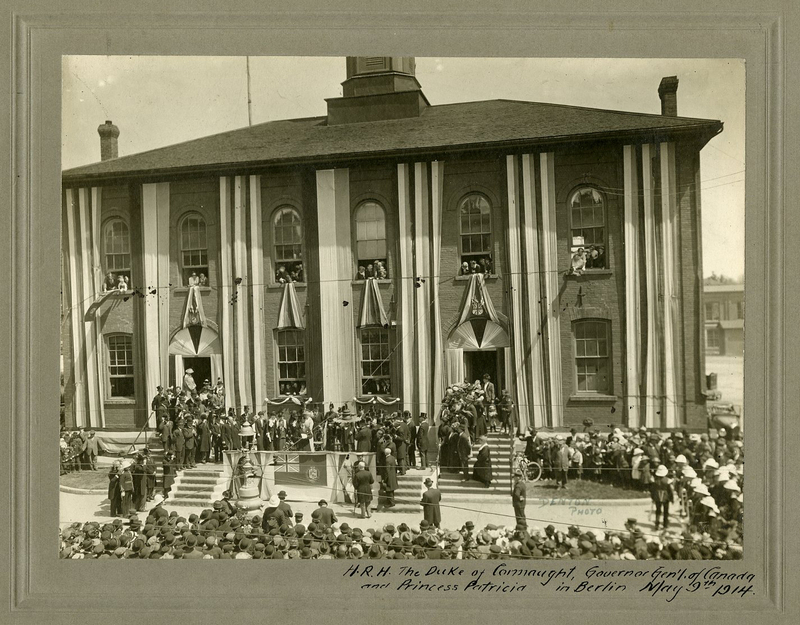 I am happy to announce, after many months of research and planning, the launch of a series of collaborative Grace Schmidt Room/KPL and Canada Science and Technology Museum blog posts about panoramic photography and renowned Kitchener photographer, Ernest Denton. The blog posts will start today and will appear every Wednesday until the end of March. It’s been an amazing year working with Michel Labrecque, Assistant Curator at the Canada Science and Technology Museum (CSTM), in Ottawa, and I hope that you will enjoy our findings. Michel kicks off the series today on the CSTM blog, Collect Connect. Click here to see Michel’s post. Enjoy!